The summertime isn’t a usual time for soup, I’ll admit, but since I’ve been on this lower carb kick, I’ve been eating a lot of soups and stews. Avoiding too much pasta cuts out a lot of casseroles, right? So I had a pre-cooked barbecued chicken in the fridge from the grocery store. But honestly, I am not a fan of chicken noodle soup. I think I got sick too many times when I was a kid, so I’m just not a fan of one of the best home remedies in the world. I’ll eat it if I’m sick, but I’m not going to eat it “just because”. So, I thought, why not make something heartier? Why not make something more flavourful? 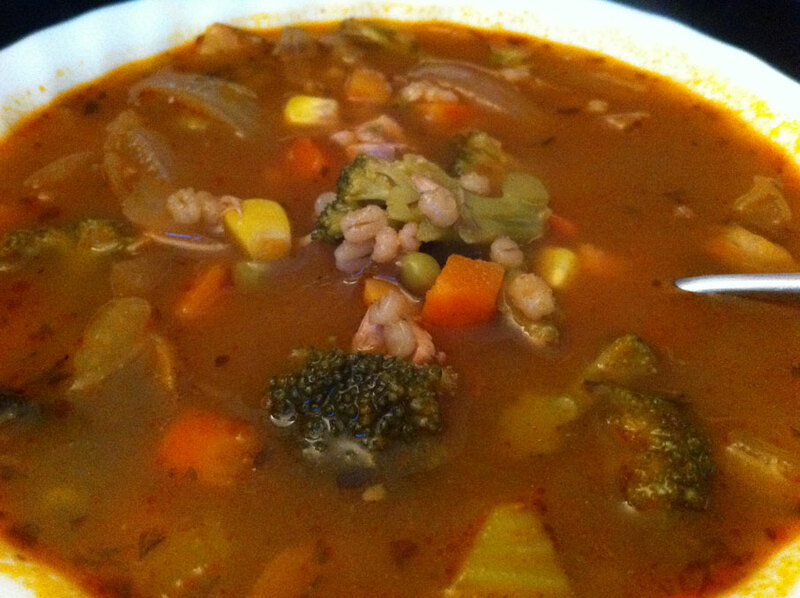 I still had barley in the cupboard and a lot of veggies in the fridge and freezer that could be used up. Why not? Before long, I was saying to myself, “Soup’s on!” I’ll warn that since I don’t use a lot of salt anymore, my soups are getting heavier and heavier in the seasonings department. But don’t worry, it’s worth it, and it’s not as bad as it looks. In a large soup pot over a medium heat, saute onions until they begin to get soft. Add carrots and celery and cook until they start to soften as well. Add all the dry seasonings and the Chili Pepper paste and stir well. Deglaze with the wine and bring to a simmer. Add the broth and stock, along with the barbecue sauce and stir well. Add the barley, veggies, soy sauce, Worcestershire sauce and mushrooms and bring to a boil. Lower heat and simmer for as long as the barley package states. Remove from heat and serve with a half-sandwich or salad. Servings: Makes about 20 servings (roughly 1 cup or so). This entry was posted in Carb-friendly foods, dinner, Lunch, nutritional values, one-pot-wonders, recipe, soups, stove-top and tagged barbecue sauce, black pepper, broccoli, carrot, celery, chicken, chili pepper paste, corn, cumin, curry powder, frozen vegetables, garlic powder, green beans, Mrs Dash, mrs. dash table blend, mushrooms, onion, onion powder, oregano, paprika, pearl barley, peas, red wine, reduced sodium soy sauce, worcestershire sauce. Bookmark the permalink.